Russian military equipment exhibits drew significant attention from various delegations at the concluding Aero India 2017 exhibitions, while Russia and India further cemented military technical cooperation by agreeing on joint projects and discussing the supply of Russian equipment to India. MOSCOW (Sputnik) — The 11th edition of the Aero India exhibition is taking place on February 15-18 and is organized by India’s Defense Ministry at Air Force Base Yelahanka in the city of Bengaluru. The event focuses on aerospace, defense, civil aviation, airport infrastructure and defense engineering. The business part of the exhibition wrapped up on Friday. The Russian exhibit, organized by the state arms exporter Rosoboronexport, featured over 400 exhibits, including a fifth-generation fighter jet and the latest attack helicopter models. Over 40 defense sector companies took part, including Almaz-Antey, the United Aircraft Corporation, MiG and the Sukhoi Company. Rostec state corporation's director for international cooperation, Victor Kladov, headed the Russian delegation. Delegations from several countries showed interest in Russian Orlan drones, spurred by their successful use in Russia's anti-terrorist operation in Syria. "In this respect we have projects such as Orlan, for example, other projects of Russia's defense industry, of Shvabe Holding, there are 3D technologies, when a drone is produced within several hours using a [3D] printer," Kladov said on Friday. The Orlan-10 is a medium-range, multi-purpose unmanned aerial vehicle (UAV) developed by Russia's Special Technology Center in 2010. The drone is intended for aerial reconnaissance, observation, monitoring, search and rescue, combat training, jamming, detection of radio signals, and target tracking. Russia and India are major partners in the military technology sector. A significant portion of the the Indian army's equipment is either from Russia and the Soviet Union or produced under license from Russia. India purchases billions of US dollars’ worth of Russian equipment each year. Russia now plans to take part in India's tender on the supply of 400 fighter jets for its Air Force, Federal Service for Military-Technical Cooperation (FSMTC) Deputy Director Vladimir Drozhzhov said. "We will certainly participate in this tender, and even before the announcement of the tender, we sent our proposals to India," Vladimir Drozhzhov said, adding that Moscow would offer MiG and Sukhoi aircraft to New Delhi. The military technology cooperation head also said that Russia was willing to help India with licensed production at home by ramping up the production of its Sukhoi Su-30MKI fighter jets in India. India's Hindustan Aeronautics Limited (HAL) is currently producing Su-30MKI super-maneuverable fighter jets in India under the license from Russian Sukhoi aircraft manufacturer. 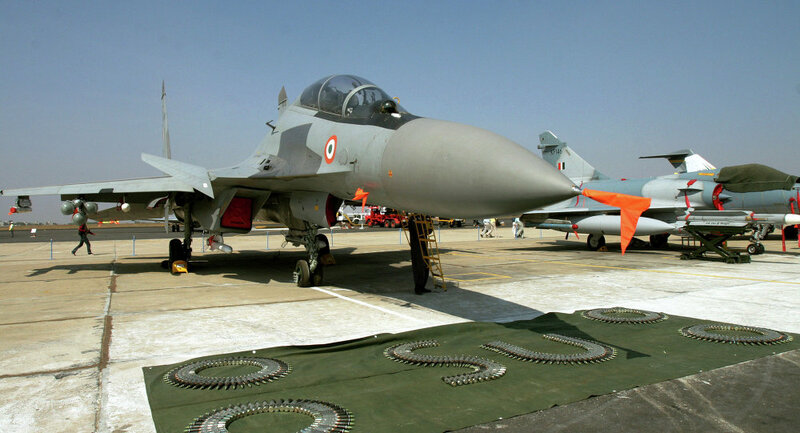 The Indian Air Force has a fleet of over 200 Su-30MKI fighter jets that were built in India under the license. On Wednesday, the CEO of Russian United Engine Corporation, Aleksander Artyuhov, said that upgraded Su-30MKI jets would be equipped with new AL-41F turbofan engines designed for 4++ generation aircraft that are currently being installed on Russian Su-35 fighters. In turn, the United Engine Corporation (UEC) said it developed a post-sales servicing scheme for its Klimov RD-33MK turbofan engines previously fitted on Mikoyan MiG-29K carrier-based multirole fighters in service with the Indian Navy. The servicing program provides technical support throughout the post-warranty period and includes the entire range of possible services, according to the company. The RD-33MK engine is an upgraded variant of the RD-33 with increased thrust and a modern digital automatic control system. On the sidelines of Aero India, Russia and India agreed on a draft contract for the development of a joint Fifth Generation Fighter Aircraft (FGFA), FSMTC deputy head Drozhzhov said. "Russian and Indian experts agreed and initialed the draft contract on the design work on the creation of prospective multifunctional fighter. The Russian side is ready to sign the contract. We expect the decision of our Indian partners on this issue," he stated. The FGFA is based on the Russian Sukhoi T-50 (PAK FA) fifth-generation stealth fighter aircraft. It is a single-seat, twin-engine multirole jet fighter designed for air superiority and attack roles. The project came about following the signing of a Russian-Indian cooperation agreement on October 18, 2007. According to Kladov, Russia will take part in the development of India's fifth-generation Advanced Medium Combat Aircraft (AMCA) project. "We will certainly take part in this project. Once we see the terms of reference, we will determine the aircraft that will participate in the tender. We can offer the latest modernization of the MiG-31, MiG-35, the brand new PAK FA and the modernized version of the Su-30MKI," Kladov said on Thursday. The AMCA project is being developed by an aerospace industry team comprising the Indian Aeronautical Development Agency and HAL. A single-seat, twine-engine, mutirole fighter aircraft equipped with stealth technology is reportedly expected to make its first fly by 2024. Rosoboronexport Deputy Director General Sergey Goreslavsky, who led the exporter's delegation, stated that HAL had requested the supply of radar stations for its Tejas multirole fighters. A contract is expected to be signed soon. © Photo: Russian Aircraft Corporation "MiG"
Some 30 foreign clients, including the Indian air force, plan to hold talks with the Russian Aircraft Corporation MiG, the company's Director General Ilya Tarasenko said. Particular interest was drawn by MiG-35 multirole fighters. The Russian MiG-35 (NATO reporting name Fulcrum-F) is a 4++ generation jet, which has been created with the use of technical decisions used in the MiG-29M/M2 and MiG-29K/KUB aircraft and new advanced technologies. It was unveiled at Aero India 2007 and India is viewed as one of the most important foreign customers for the jet. It is capable of speeds up to 2,700 kilometers per hour (1,700 miles per hour) and a combat radius of 1,000 kilometers. "We are going to this air show with our main product to date, MiG-35. We have confirmed some 30 negotiations during the exhibition, and we will also show it to our main customer, the Indian Air Force, with which we will hold talks in Bengaluru through the Rosoboronexport," Tarasenko said. He added that almost all countries using MiG-29 fighters were interested in purchasing the MiG-35 aircraft developed on MiG-29 basis because they would not need to rebuild their air force infrastructure around the new jets. "All the [needed] training of technicians and the pilots is already there, they just need to update their skills, it will take little time," Tarasenko pointed out, noting that a naval variant of the jet could also be developed. Sudan and Peru were interested in upgrading their MiG-29 jets, with the sides planning to sign a contract next year. Another deal involves Serbia. A contract for the repair and modernization of six MiG-29 aircraft, which are planned to be supplied to the Serbian Air Force, is likely to be signed in the near future, Tarasenko said. 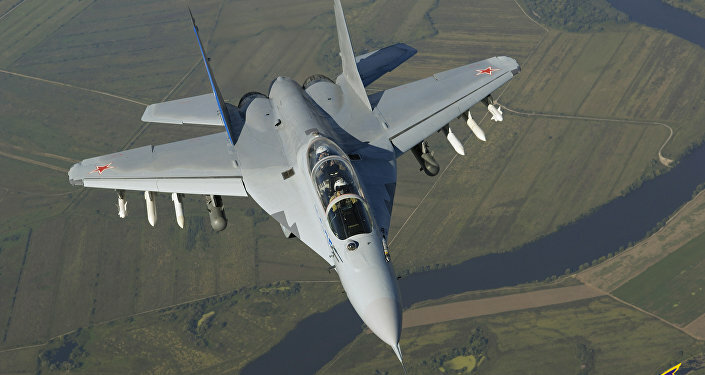 On February 5, Serbian media reported, citing the country's Defense Ministry, that six MiG-29 fighter jets from Russia would arrive in the country before the end of April. In December, Serbian Prime Minister Aleksandar Vucic said that the first modernization stages of the aircraft would cost between 180 million euros ($187 million) and 230 million euros. 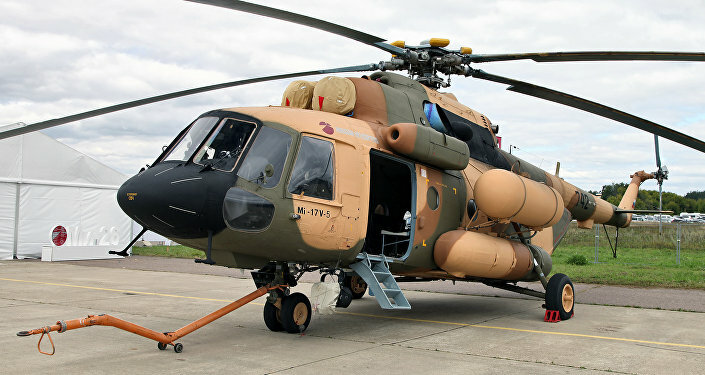 Russia is expecting to sign a contract on the supply of a batch of 48 Mil Mi-17 helicopters to India by the end of the year, Drozhzhov said. India already uses a broad range of Mi-17 and Mi-8 transport helicopter variants. These are used in search and rescue operations, passenger transport and are involved in the protection of forests and fisheries. The Russian Helicopters company said it was conducting a test project on offering after-sales service to its customers in India. The company will use the results to create a universal after-sales service system for all its customers who will be offered contract lifecycle management services. The company is also looking to boost spare parts sales to Indian customers as part of the lifecycle service scheme, Igor Chechikov, the holding's deputy CEO for aftersales service, said. "The vehicles are being used very intensively, they are taking part in practically all operations on Indian territory, including military and humanitarian ones, and they are using up their service life. We expect a significant increase in repairs and spare parts supplies," he said. India and Russia are close to finalizing documents on starting the joint production of Kamov Ka-226 light utility helicopters in India. "If everything goes well, the first deliveries will start over the course of the year," Victor Kladov said. The joint venture agreement on Ka-226T helicopters was signed by Russia and India in October 2016. A total of 200 helicopters are to be supplied within nine years, with 60 vehicles to be manufactured in Russia and the other 140 in India. Technodinamika, an aerospace design, engineering, manufacturing company belonging to Rostec, took part in Aero India for the first time this year. The company talked about localizing some activity in India and increasing the range of products and services on offer to Indian clients. Technodinamika is eyeing to become a supplier for HAL and take part in joint projects under the Make in India program. Cooperation with HAL would involve the joint development of parts and systems for Russian jets and helicopters with a view to produce them in India. "The holding is ready to take part in developing oxygen and fuel supply systems, including accident-proof systems for planes and helicopters, electric systems and other systems which we are competent in and which the Indian side is interested in," company Director Igor Nasenkov said. The supplies of Russian S-400 missile systems to India are unlikely to start this year but may take place in the following years. "There are two sides here, the Russian one and the Indian one, there are talks on a contract. The issue of when it will be supplied will be resolved once the contract is signed. I don't think it will happen in 2017," FSMTC's Drozhzhov said. The contract itself is, however, likely to be signed by the end of the year. The general agreement on supplying India with S-400 systems was reached during October's meeting between Russian President Vladimir Putin and Indian Prime Minister Narendra Modi within the framework of BRICS summit in Goa. The S-400 Triumph is a next-generation mobile surface-to-air missile system which integrates a multifunctional radar, autonomous detection and targeting systems, anti-aircraft missile systems, launchers, and a command and control center. It is capable of firing three types of missiles that can hit aerial targets at short-to-extremely long ranges. Russia has so far closed a deal to supply the system to China. "According to the experience of implementing such contracts, supplies could begin within two-three years after the signing," Rostec's Victor Kladov said. The actual time terms will depend on Almaz-Antey, the defense manufacturer which makes the surface-to-air missile systems, he added. The number of S-400 battalions to be delivered to India is yet to be agreed amid ongoing negotiations with Russia, Rostec state corporation's chief international cooperation official told Sputnik on Thursday. Indian border guards as well as the country's Ministry of Home Affairs expressed interest in radar station Sova (Owl) showcased by the Russian Almaz-Antey concern. "We presented complexes for security systems, that is a multipurpose radar station… Particularly, our Indian partners — the Ministry of Home Affairs and the Border Security Force, have shown interest in the Sova station," Almaz-Antey Deputy Director General Vyacheslav Dzirkaln said on Thursday. Indian border service, as well as armed forces, were also interested in Russia's new SOKOL security system, according to Rosoboronexport deputy head Goreslavsky. SOKOL uses cameras and heat detectors to find security breaches before sending data to security personnel. Detectors can be concealed underground and provide the guarded area with a multi-layer protection system. The system is capable of covering up boundaries of up to 100 kilometers (60 miles) and have an accuracy range of five meters (16 feet). The system drew Indian interest due to the country's terrorist concerns. Rosoboronexport said it was ready to tailor SOKOL to Indian needs.